Travel and adventure; they’re as intrinsic to the Victorinox lifeblood as the original Swiss Army Knife itself. So we’ve created the "Place to be" series of knives dedicated to different destinations around the world. But they come with a little twist – each knife is only available in the city after which it is named, meaning the Zürich knife is only available in our Zürich shop, Brunnen in Brunnen and so on. How to find the store location? Just enter the GPS coordinates into your route finder. 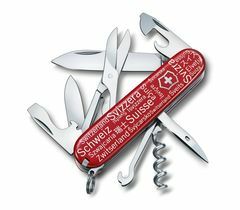 The Switzerland knife is available in all of our Swiss stores, as well as our Swiss online shop. So head out and create your own little Swiss Army Knife collection of the places you have been to.